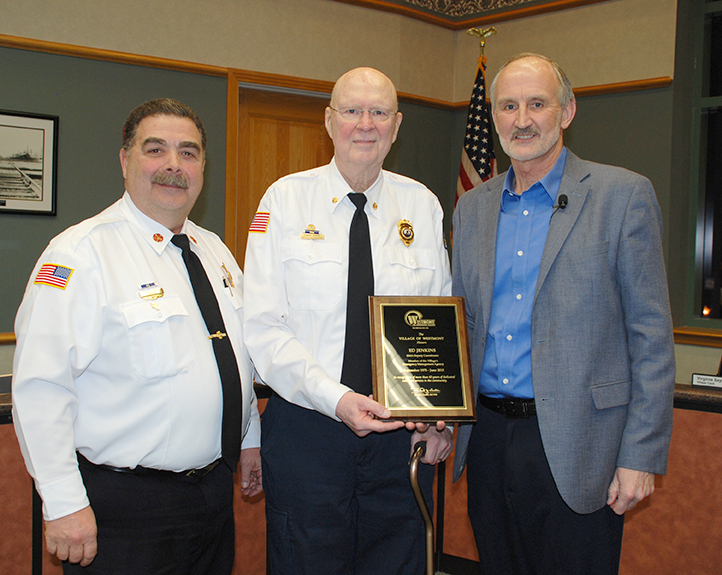 At the Westmont Village Board meeting on March 3, 2016, the Village of Westmont recognized Ed Jenkins for 45 years of service as an Emergency Management Agency (EMA) volunteer in the community. “We can not thank Ed enough for his outstanding contribution to Westmont,” says Fire Chief Dave Weiss. “Ed has been an important part of our operation for more than four decades.” His journey started in 1970 when Westmont first started to having ESDA members. Ed was a vital part in moving Westmont EMA to where it is today. Ed was instrumental in acquiring light towers and placing an EMA trailer into service for use in emergency situations. Ed has been a true leader and mentor for the entire Westmont EMA team. In honor of this extraordinary commitment to the community, Ed Jenkins received the Westmont Fire Department’s first-ever Fire Department/EMA Lifetime Achievement Award. Congratulations Ed and thank you for all you have done!